It has been an amazing series so far. Speaking from the point of view of a steadfast passionate Indian Cricket Fan of course. India has won the first two ODI matches. The third match begins tomorrow, Feb 7th at 4 pm. Make sure that your lineup is up and ready well in advance. The number of pools is increasing because of the high demand. Keep track of the different pools. You do know that you can add and submit up to four different lineups. So, you can change your combination for every different lineup. For one, you can add two wrist spinners ( who are doing supremely well) and two fast bowlers. For another, you can add three seamers and one spinner. If the pools are full now, do not worry. Keep an eye on the app. More will be added closer to the match. Point to be noted - South Africa lost 13 of their 18 wickets to wrist spin. That should tell you how your lineup could look like. Let’s talk about the latest news. Another blow for South Africa. De Kock Ruled Out of ODIs & T20Is Against India With Wrist Injury. That’s three down.Quinton De Kock. Ab de Villiers. And Faf du Plessis. South Africa is now under immense pressure. Loss of three strong players ( 4 counting Steyn. 5 counting Philander). South Africa’s vision 2019 plan for the world cup was to experiment with as many players as possible to find the right combination. They are starting this experiment sooner than planned thanks to all the unplanned injuries. Behardien, a consistent player in the domestic ODI scenario, was left out until the last minute. Until he was desperately needed. 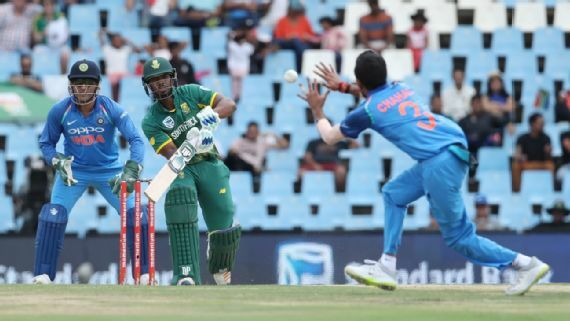 Debutant Zondo made a difference despite the rest of the batting order failing. 25 runs and a calm head. You could have these two men in your lineup. They want to make their mark. There is also David Miller. And Chris Morris. Don’t forget New boy new captain Aiden Markram. He might open given that De Kock is out. The selectors will not name a replacement for De Kock in the squad, apparently. The bowlers need to step up for sure. Rohit Sharma needs to step up. With a strike rate of almost 60 and a sad average of 13.45, Rohit has to make his mark. The wrist spinners are spinning in their winning moments. Considering the pitch, the seamers have every advantage to collect wickets too. This ODI is supposed to be between two best teams of the best teams in the world. Team India is currently on top thanks to their allrounder performance. There is every chance that India could walk away as winners of the ODI series. And the door is wide open for the T20. Keep an eye on your lineup on the Fantain Fantasy App. You have just the same opportunity to walk away as winners too.